THE MECHANISM OF KNOWLEDGE STORAGE. The storage of knowledge is one of the mysteries in science. Knowledge and consciousness are some of the most important 'phenomena' in understanding life. So what's the mechanism behind them? This mechanism must explain: observation (collection of data), storage (brain-structure), access (memory and different brain-waves), tagging (hierarchic values or weight), repositioning of values (learning),, emotions (love, art, anger, ...), time-appreciation and planning (past, NOW, future), reasoning (abstract, semantic), intelligence, communication (reproduction/interaction), filtering (collective unconsciousness, unconsciousness, and consciousness =choice/free will). The central question is that of storage, coupling and intertwining sensed data, and self-generate tagging and priorities. Pelastration offers a mechanical approach that is based on real "mechanical contact" and will transfer (or better 'translate') information by inter-membrane layer surface contact. Since each layers inside a "HOLON" has other properties (read: amplitudes which are not sympathetic) a number of informations will not be possible to store. If the layers are although related in frequency they will oscillate and the lower (inside) layers will be excited too. The excitation of a layer may create sub-tubes which can pelastrate in a new sub-holon. This new sub-holon will have characteristics which refer to the initiating outer information. So - within the structural limits of the main-holon - a type of reproduction or quantum copy of the 'experienced' outer event is now stored inside the main-pellon. This stored copy stays there when the causing event stops. Inside the brain the event has it's own 'reality' spot. The frequency of that specific "information-holon" can be accessed (touched, contacted) by other sub-tubes which will co-vibrate, and that will bring the information to other layers, till the 'conscious level' and 'unconscious' state. The "information-holon" will still contain the basic information (without losing). That's memory. thus providing information without losing it. Our brain will contain billions of such main- and sub-holons. Such systems are active in the synapses, micro-tubules, actin, dendrite, neuro-transmitters, etc., but also in all processes in our body. Below you see the main picture. Outside information (D,F and Green) will be translated into inside information (D in E, F in general co-vibration with Yellow, and Green will create B.
E may disappear when D leaves, as long as H keeps them together the joint between F and Yellow stays, and B will stay even when Green leaves. So the membrane can create - depending from the stretchability - also outside or inside of the specific holon - on all levels of layers - tiny micro membrane tubes. 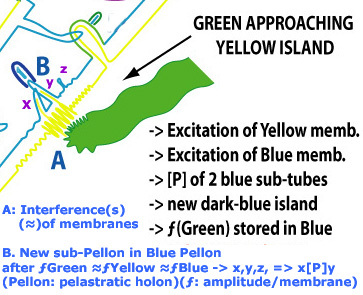 For example: The yellow membrane can be excited by an external holon (green in image). This can be for example: the experience and notion 'SNOW'. Now the blue membrane (in the center) represents: the notion: 'WHITE'. 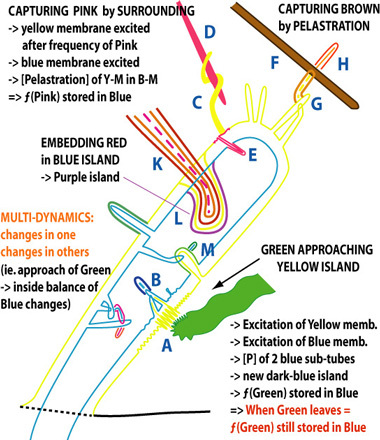 The new excitation by the yellow membrane vibrations will create interference vibrations in the blue membrane and create this way thousands of tiny sub-blue-membrane tubes. Some of these sub-tubes will couple. This way an ASSOCIATION is made inside the blue area of WHITE + SNOW. That sub-holon will stay 'active of present' as long as it is not 'destroyed' by other vibrations. Here again the historical layering is important, because all previous associations are collected inside the blue holon. That's how the storage of knowledge, consciousness, learning, etc. can be explained in a mechanical way. The mechanism of quantum jumps works differently: A 'wave' is a transport tube + an attached particle tube. The 'mediator' tube transports the 'energy' tube which - on approach is detached from the transporter - and embeds into the 'measuring' pellon (measuring device). The moment of the impact the 'particle' is absorbed by the device, thus the energy is added and measured. The attachment can happen in several ways. Now Hammeroff-Penrose developed the OR-Approach to explain via Quantum Superposition knowledge and consciousness. Here you have an overview of the major differences. (for large image: download the pdf-file). 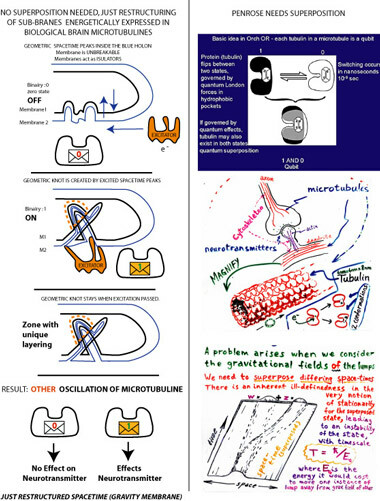 In this context it is important to check also this pdf-file:"The causal consciousness: Beta-neurexin promotes neuromediator release via vibrationally assisted multidimensional tunneling" (2002) of Prof. Danko Dimchev Georgiev, Medical University Of Varna, Bulgaria. Some extra's: "Images" oscillates another level of brain-activities than words. Visual information always goes inside our understanding WITHOUT prejudice. Written language we can "refuse or ignore" direct or indirectly because it's maybe in another language, we don't know some of the words, or our understanding can't capture the logic. Visual information goes direct. One picture says more then 1000 words. Understanding and memory is also a layered complex of pelastrated data and interconnections primary based in our brain system. Short and long memory indicate the way we can access and store information. When we learn we store information by joining (biological level of pelastration) in the synapse network at a certain location "data of an observed (reality) event". (cfr. microtubules of Penrose). The essence of the basic interconnectivity of consciouness is caused by the interacting between the various spacetime layers inside us. You can find this on next page where you will see next images. There is a constant Attention Shift. Important: remember that pelastration is an holonic system and each pelastration contains in his layering "ALL the historical records" of his previous pelastrations.So on a certain level these separate holons (islands) have a common starting holon. © Dirk Laureyssens, 2002/03. All rights reserved.